Veggie fritters are the perfect frit — err, fit — for a kid-friendly lunch. The first time your kids try them, they’re sure to ask for seconds. Healthy cookies? Well, lookie here. 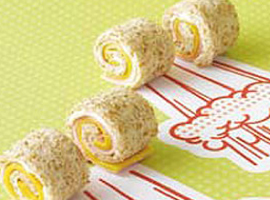 Make a game plan to make them for your next party… or any time! When life gives you lemons, make Blackberry Lemon Scones. Invest in this zesty, nutritious breakfast idea today. Need a party dish? Help everyone eat healthy with this super simple veggie dip. Be sure to lose the chips and stick with carrots and celery, too. With only 4 ingredients, you can make these Campfire Cracker snacks in a flash! Set your camp-sights on this recipe today! Broccoli Cheddar Stuffed Potato Skins? Now that’s the stuff! Try this healthy, super po-tatsy appetizer today! Having a fiesta? Set out a bowl of these crispy, healthy tortilla chips for your amigos. Want to feel head-over-heels healthy? Take these fun, creative Valentine-themed recipes to heart. Whether you’re a big dipper or little dipper, these Tuna Dippers will leave you feeling like a star every time. 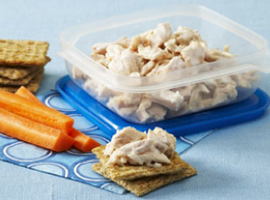 If you’re wondering what to snack on… pin your hopes on this easy-to-make idea. Roll up some turkey and cheese into little snack-size Pinwheel Bites. They’re the wheel deal. Need dessert ideas for your next par-tay? 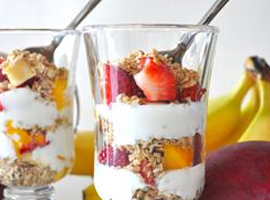 Try a healthy parfait! All you need are strawberries (or whatever fruit you want! ), low-fat yogurt and granola. Here’s a tip: this Mexican Salsa Dip makes for an excellent snack. Dip into some today. Pining for a unique, healthy salsa recipe? This pineapple-avocado-filled one will hit the spot. For a hearty snack, this Black Bean Salsa is where it’s at. Freshen up your next snack time with a batch of this fresh salsa.